I am writing in reply to your letter of 16th January about the Ballot Vote at Oldham. I am still most disturbed about the attitude to longer hours and I hope that you will do your best in the talks to correct the erroneous impression that the production target in textiles is being attained. While it is true that the industry is doing very well, the 10% increase in production was, of course, merely a stage towards the ultimate target. 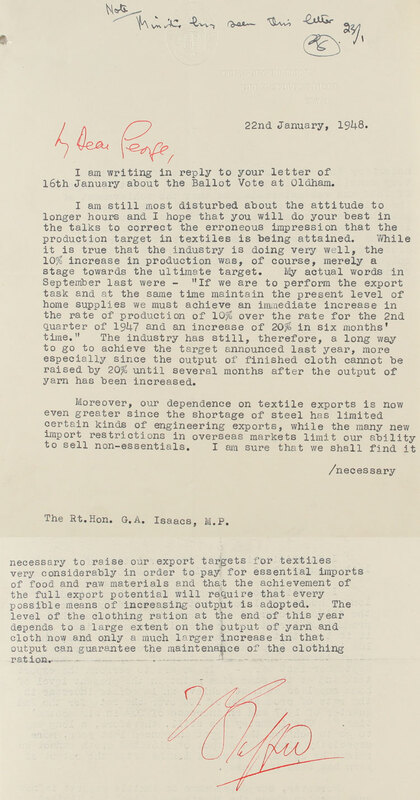 My actual words in September last were- “If we are to perform the export task and at the same time maintain the present level of home supplies we must achieve an immediate increase in the rate of production of 10% over the rate for the 2nd quarter of 1947 and an increase of 20% in six months’ time.” The industry has still, therefore, a long way to go to achieve the target announced last year, more especially since the output of finished cloth cannot be raised by 20% until several months after the output of yarn has been increased. 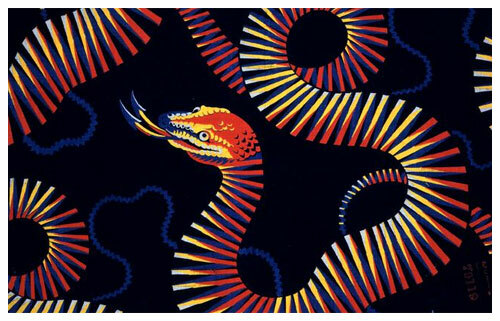 Moreover, our dependence on textile exports is now even greater since the shortage of steel has limited certain kinds of engineering exports, while the many new import restrictions in overseas markets limit our ability to sell non-essentials. I am sure that we shall find it necessary to raise our export targets for textiles very considerably in order to pay for essential imports of food and raw materials and the achievement of the full export potential will require that every possible means of increasing output is adopted. The level of the clothing ration at the end of this year depends to a large extent on the output of yarn and cloth now and only a much larger increase in that output can guarantee the maintenance of the clothing ration.